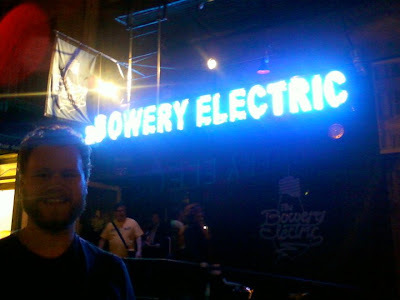 Tonight we left the Bowery Electric rejuvenated, excited, and well . . . electric. Brick walls, beers, and artistic veterans of the Bowery crowded the stage for a 45 minute stop on the NYC Lit Crawl. Les and I came to see only this event because Bob Hollman, the creator and proprietor of the Bowery Poetry Club, was reading with friends, and because I was leery of going to any performance event on 9/11. Though this day brings the city and much of America together, it's gloomy. New Yorkers above all have a right to be gloomy. But they weren't. The host opened with silly one-liners and the truth that a single event has turned the nation into a Kingdom of Fear. Hollman got the night rolling, his cigarette baritone dancing tenured poems a la tango and retro and humorous. But Jim Feast had us in stitches with a piece on Bloomberg's losing sleep, planning his election on the night of 9/11: "Why the towers? Like a moth to the flame, the terrorists chose a skyscraper -- not a bungalow or cottage or motel. 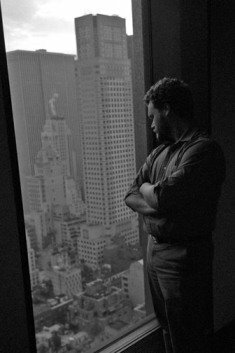 And if only a skyscraper were in the the Bowery, a center of poets not stockbrokers, the city would be clean of vermin and clear for commerce!" Steve Dalachinsky closed the night with a poem "written too soon after the event, but what the hell" that made me warm to gloom, to NYC, to being here and now. Before the-powers-that-be traded artists for towers in the Bowery, before terrorist smashed faith for fear with a plane, these guys were here and still are. Wow. So perfectly written. I couldn't have said it any better...such a magical night and you captured it perfectly! "Before the-powers-that-be traded artists for towers in the Bowery, before terrorist smashed faith for fear with a plane, these guys were here and still are."...LOVE! Do you ever see yourself in such a venue where you use your talents, dumbfounding the ones that view creativity just below a divine gift? Never sell yourself short. The wisdom from within will make their jaws drop, just remember who it came from and where it's taken you. Until then, make the most of where you are, who you're with, and where you're going. Thanks for the kind words, Camilla. I've been attending more events in preparation to dive in myself. I'm also looking to submit my work to journals and competitions for the first time in years. It's a perfect time for me to read this. Thanks, again.